Job Acceptance letter is needed when you accept a new job. Although, this is not a mandatory document but it does reflect your professionalism. The letter also clarifies important details regarding the job acceptance like designation, salary, incentives and other things related to job profile so that there is no confusion. It act as a document of clear communication between the company and the employee Acceptance Letter on terms and condition before getting on the board. 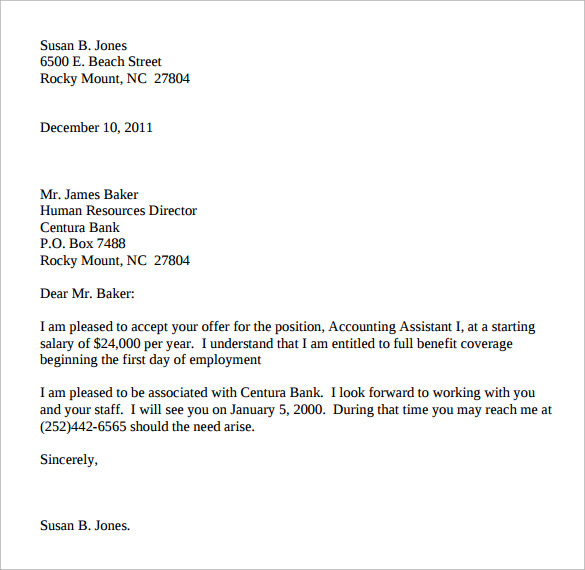 Job acceptance letter templates are easily available online in various designs and formats. One can select the template that is brief, look professional and has positive language. 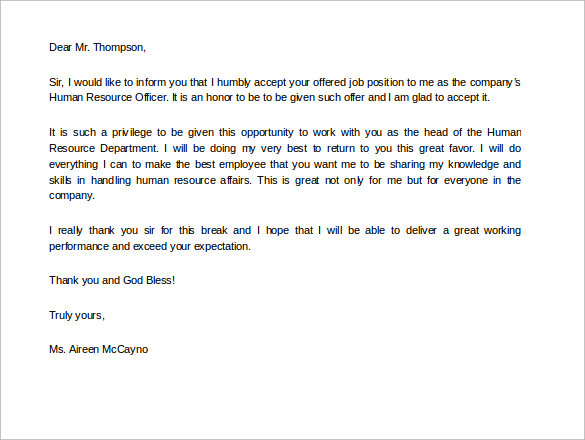 This template is free to download and is essentially a note of thanks for accepting the job offered. The template is simple yet impactful. The template reflects that the employee is honoured to join the company and will be dedicated towards the duties assigned. The template is polite and brief in nature. As the name suggests the template can easily be downloaded and printed. The template can be edited according to your requirements and then after previewing, one can easily get the print out. The template covers all key details regarding the job profile and its benefits. The template can be downloaded for free. 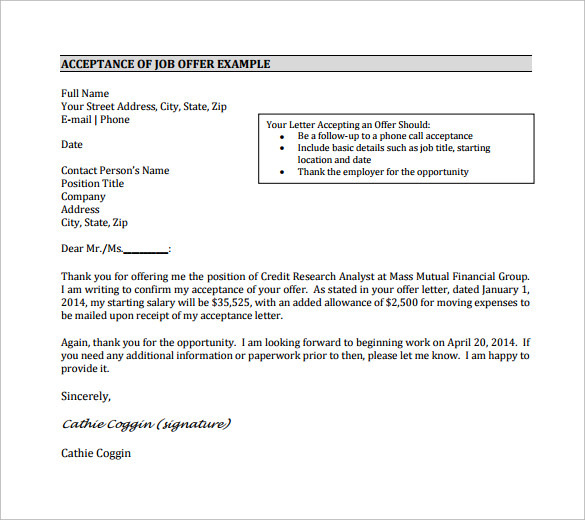 This job acceptance letter format is available in PDF. The font style, colour and text used in this template is simple but reflect professionalism. The template can be downloaded for free in PDF format and can be printed easily. 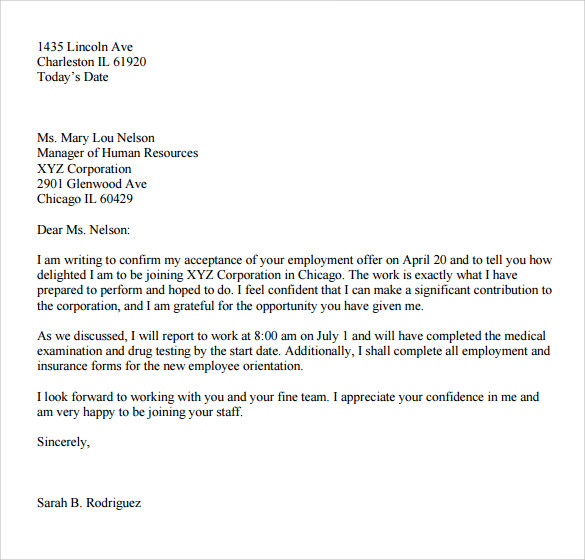 This job acceptance letter template is very useful as ir saves time and effort invested in designing a template. 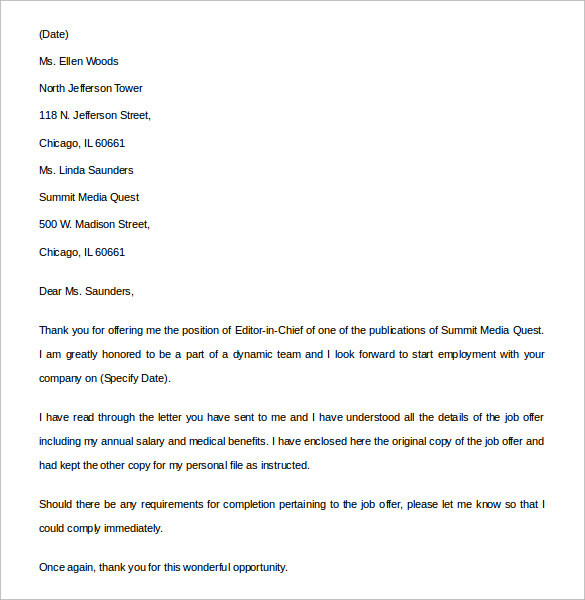 This job acceptance letter template is available in word format. The template can easily be downloaded and edited according to your requirement. The template is professional as well as positive in language. The template covers all the key point of a job and a confirmation on accepting the designation, job responsibilities, benefits, salary etc. Job acceptance letter is needed when you are joining a company on a newly designated position and want to show acceptance of the same. The letter of acceptance act as a document of accepting a job with clear understanding of job profile and its details like salary, designation, supervisor, benefits etc. 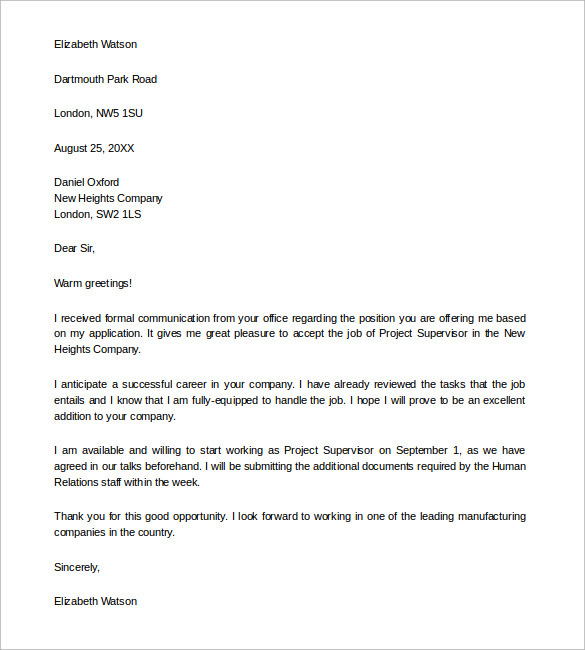 The Job Reference Letter templates are available in popular formats like Word and PDF so that you can easily download them and use them accordingly. The templates have been written by industry experts so that the job acceptance letter do not only establish a clear communication between the company and the employee but also reflect professionalism of the employee. 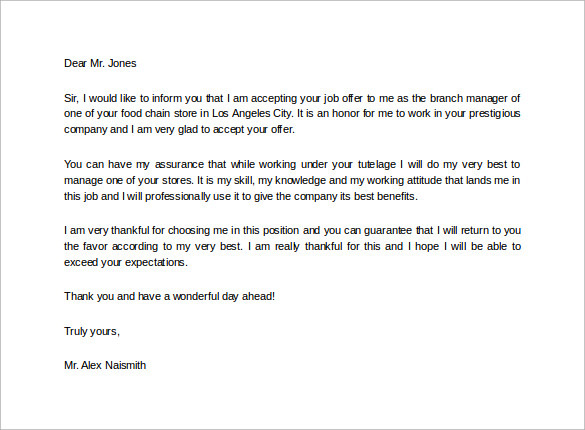 Job Acceptance letter templates are required by individuals who are ready to join a new company on a fresh position. 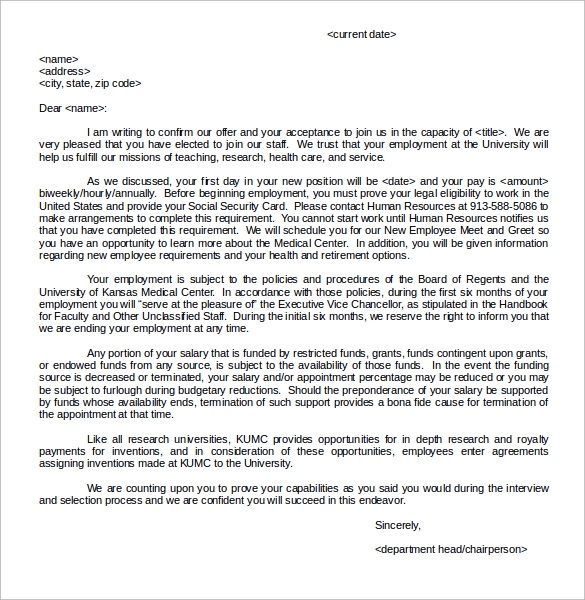 The letter acts as a document that covers acceptance on terms of salary, position, benefits and other things related to job profile offered to an individual. The letter is a formal way of accepting a job along with agreeing to terms and conditions applicable to a job. If you are thinking on how to write an Job Notice Letter then do not worry as you can get numerous job acceptance letter sample online. Select the job acceptance letter that is brief, professional and is polite in nature. 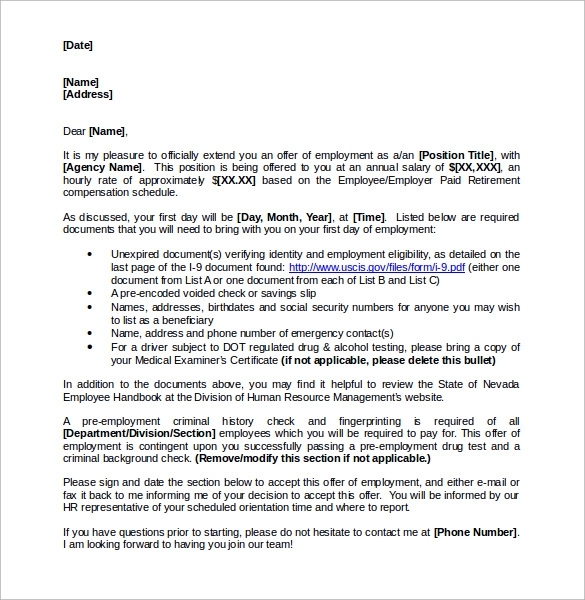 Job acceptance letter is a document that puts together all the key points of the newly appointed job. 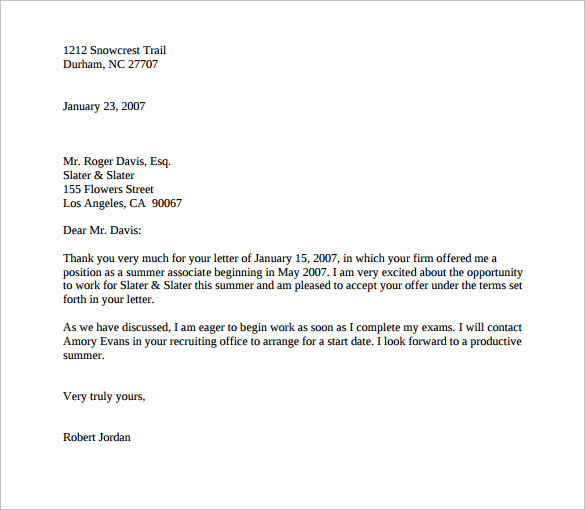 The letter is a formal acceptance of the job and its terms and conditions. 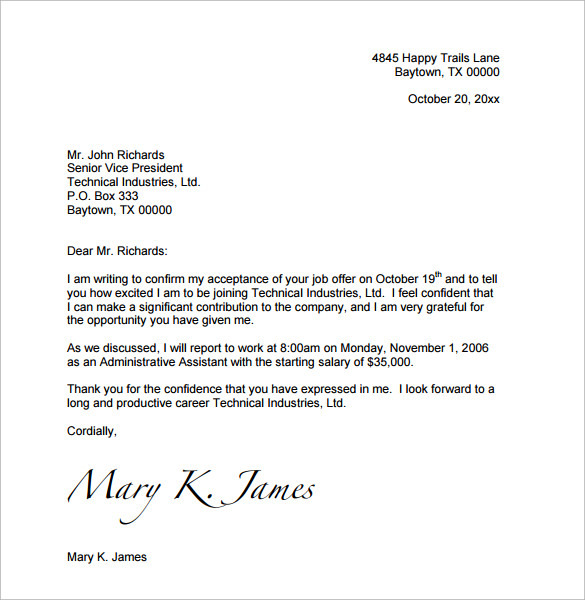 The job letter acceptance templates are beneficial as they are designed by experts and save your time and effort in designing and formatting. The design, font style, text, colours and other elements are put together to meet the professional standard. The templates are available in both Word and PDF format so that one can easily download them and edit them according to their requirement. There are numerous templates available online for free. 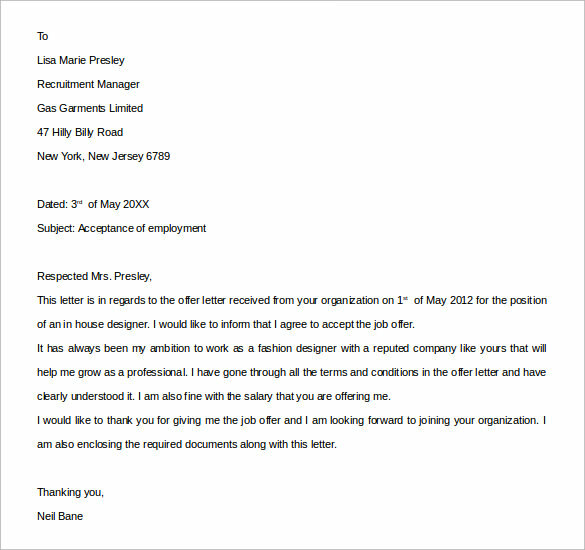 Using a job acceptance letter template helps you in writing a professional, brief and positive letter that reflect the sense of responsibility of an employee towards an company he/she is about to join. These templates have been designed to cover the key points of job in an effective manner before going on board.